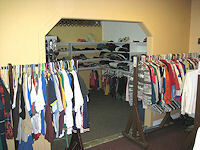 ROC provides weather appropriate clothing year round to any of our clients in need. From simple outdoor wear to that perfect outfit for a job interview, we try to carry it all. We have handbags and a good selection of shoes and accessories that clients can pick up during distribution hours. In our kids corner we have clothing, shoes, accessories, and even toys for the young folks. We are always looking for clean, weather appropriate clothing to provide our clients. 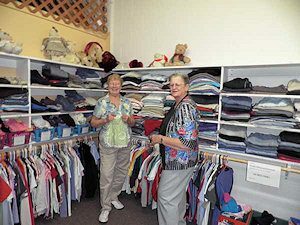 Next time you are cleaning out your closets and drawers remember ROC with your donations. We provide all these items free of charge to anyone in need. You can donate in person at the ROC address below during the donation hours under the ‘Location & Hours’ tab.